It's a regular tale of two co-ops these days in central Durham. From the good-news perspective, the Durham Central Market effort continues to gather steam. DCM (whose leadership includes, in full disclosure, friend and fellow Dermblogger Michael Bacon) has now launched a pretty good-looking web site at durhamcentralmarket.org. When developers came to the Old North Durham Neighborhood Association (ONDNA) potluck in February 2007 and told them about their future buildings and businesses, the question asked was "Can we have a grocery store?" The answer was, "Sure... if you want one.... and you do the footwork." A group from OND formed with other interested people to see about just that: could we have a natural foods store/market/meeting place in our area? After conducting a feasibility study, the answer is yes, given the current and future residences and businesses in OND, Durham Central Park, downtown, and nearby neighborhoods. For years, I've sat in the dining room at Mad Hatter's at the corner of Main and Broad St., looking out across the parking lot and Main St. at the woods just beyond the road. How bucolic it felt, having a stand of trees nestled in the heart of the city, given a pastoral feel to the center of the town. I'm slightly embarassed to admit that, for a while after I moved here, I didn't realize that one of the ragged, disconnected bits of Pettigrew St. ran behind the trees, along with a few good-sized buildings. The railroad has made the pre-eminence of its tenure clear in a very visible way in recent days, clearing out a wide swath of trees and brush from alongside the lines. Scientific Properties and Duke's Nasher Museum of Art kicked off the first major public event at Golden Belt last night, a party celebrating the opening of Golden Belt's contemporary art gallery, ROOM 100 -- and a chance for art patrons from throughout the Triangle to get a peek at the nearly-completed Golden Belt arts complex. 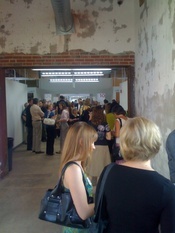 Organizers originally anticipated a turnout of 100, but found three times that number RSVP'ing to get a chance to see the Golden Belt artist studio and live/work apartment spaces, including members of the Nasher's Young Friends organization and that of its peer at Raleigh's N.C. Museum of Art. Besides the opening of ROOM 100 and it Branch Gallery-curated first exhibits, one of the real highlights of the evening was the chance to tour the 35 artists' studios rented by local practitioners of fields ranging from painting to photography to jewelry to crafts. Most of the studios were occupied by their tenants, many of whom had work for sale on display in the space. Rumors have been flying for the last day about some manner of change at the Herald-Sun, which has gone through its share of turmoil in the last several years since the hometown paper's sale from local ownership to small-market chain Paxton Media. Today's H-S confirms further reorganization -- read, cost-cutting -- in both the operational and newsroom aspects of the paper. Still, it's not quite clear exactly what these changes will mean for readers of the paper. First, the Herald-Sun will be laying off staff, "fewer than 10" positions company-wide, according to editor Bob Ashley's column today. These layoffs include newsroom as well as non-newsroom staff... though Ashley goes out of his way to note that the paper will be "reploy[ing]" some staff to fill vacant newsroom positions and to add a reporter slot. Ashley describes these changes as part of an effort to "restructure our editing and production," which implies to this observer that Paxton may be cutting back there and moving staff from that arena to the reporting team. Second, the paper -- already thin on some days -- looks to shrink even further, likely a reflection of the shrinking advertising revenue and demand in the print world. Thursday's Healthy Living section and Saturday's Faith and Family section are axed, replaced by condensed or merged versions of same in those days' Metro sections. Frankly, we'll be looking to some folks to rethink their jobs so that we'll produce more local stories - and concentrating on how best to present information, with more sidebars, informational boxes and other devices supplementing stories that themselves will be shorter. It's clear from the phraseology in the article that Ashley's announcement reflects at best a high-level introduction to what's changed here. Worrisome phrases abound in the piece, like "asking more of our editors," "rethink the way we approach our work," "avoiding extraneous information," "innovative ways" to meet challenges. Sounds like a call to work smarter and work harder -- not exactly the kind of clarion call one hopes to see in one's hometown paper. We'll have more on this one as we learn it. Update: The Indy's Fiona Morgan has more details. Today's H-S has two useful news bites from recent metro reporter addition Matthew Milliken, both from the Monday night County Commission meeting. First, the BOCC approved $2 million in incentives needed to entice Merck to expand its vaccine production plant up by Treyburn in northern Durham County. The pharma giant, which has yet to start producing vaccines at the site (the FDA requires several years' worth of operation before the meds can come on the market, with a 2010 bow projected for the chicken pox formula produced there), will almost double its capital investment in Durham with the new construction. A site at Pennsylvania was the runner-up for this expansion; the $2 mil in incentives pay for extending utility infrastructure to the plant, something the Keystone State site already had in hand. Not a shabby investment, it seems, for a project that will drive construction jobs up-front and an additional 150 jobs to the area. In other news, the BOCC formally approved the addition of the 1% prepared foods sales tax referendum to the November ballot, in a relatively procedural move. We can imagine Durham's deputy city manager Ted Voorhees may be stocking up on Snickers bars from the City Hall vending machines -- he's not going anywhere for a while. In news that's disappointing for the capable administrator but a plus for the Bull City, Gaithersburg, Md. has announced that Eugene, Ore.'s Anita Jones has been hired as the D.C. suburb's new city manager, according to the Montgomery County (Md.) Gazette. Voorhees was the other finalist for the position and traveled to Maryland for a public forum but came in second in a two-candidate race. Disappointing as this must be for Voorhees, as we remarked here a few weeks back, it's a positive short-run outcome for Durham, which has benefitted from Voorhees' experience and leadership on a range of tough municipal problems. It's doubly a plus given new city manager Tom Bonfield's arrival, which we understand is set to take place on or around August 11. Raleigh mall melee: A new lens into the way others see Durham? This weekend’s melee at Triangle Town Center in north Raleigh – a reportedly gang-related brawl involving as many as 200 youth – left, thankfully, few injuries. One boy was stabbed in the buttocks by a butterfly knife; a Raleigh law enforcement officer received lacerations and had to be treated at a Raleigh hospital. To me, though, the last cuts and bruises may well be the dark underbelly of class and race that the fight exposed. They’re cuts and bruises that tell me something about the nature of the perception divide in the Triangle, and about the undercurrent of fear that underlies so many assumptions that neighboring communities make about the Bull City. The project to renovate the former Holton Middle School in East Durham to become a community center -- including a wellness center partnership between Duke and Lincoln Community Health, a vo-tech center, and recreational space -- hit a minor snag this Saturday afternoon. WRAL is reporting that a fire started in one room of the structure on N. Driver St. when several drop cords connected to temporary power caused some containers of paint to catch fire. Smoke damage permeated the building but structural damage, fortunately, impacted only the one room itself. No word yet on any impact to the project timeframe; the new center has been expected to be open in time for the 2009-10 school year. The $16.7 million project is 50% funded by the City using 2005 GO bond funds. The project made its way through the Development Review Board only in June, meaning construction likely just started on the facility. It comes as little surprise to most folks in Durham that Bull City residents are willing to open their lives as well as their pocketbooks when it comes to volunteer activities. Personally, it was one of the things that most impressed me upon moving to Durham: seeing residents volunteering in such large numbers for their neighborhoods, their churches, human services organizations, non-profits of all shapes and sizes. The depth and breadth of activities by which Durhamites give so freely of their time surprised me when I moved here; I couldn't think of another community where I'd lived where you would see such a commitment to community. Well, a new survey is out from the Corporation for National & Community Service, tallying up the rates of volunteerism in communities large and small from throughout the U.S. And Durham (with Chapel Hill) placed very well in the rankings; between 2004 and 2007, 37.1% of Durhamites volunteered their time to some cause, for an average of almost 46 service hours per resident, per year. It's amazing to think of the small army of extra hands that volunteer effort represents. According to WRAL's report on the subject, Durham ranked close behind Asheville, itself 12th in the nation among smaller cities in terms of volunteer activity.